When a plant gives up photosynthesis, it can find that it's an advantage to give up a lot more too. A flower identified as Lecanorchis nigricans has been revealed to be a different identity, Lecanorchis nigricans var. patipetala. Both species are self-pollinating, but the flowers of the true L. nigricans never open. The research is published by Professor Suetsugu of Kobe University in Phytokeys this month. L. nigricans is an orchid, so it’s no surprise that is has a close relationship with fungi. However, unlike many other orchids, L. nigricans doesn’t give anything back to the fungi. It’s purely parasitic, something botanists call a mycoheterotroph (heterotroph = doesn’t make its own food, myco = gets it from fungi). There’s a New Phytologist Virtual Special Issue on the subject. It seems to be a step some orchids take after finding that fungi are working well supplying nutrients. If an orchid isn’t getting anything from sunlight then it can change its behaviour. There’s no advantage to living above ground, so they generally hide below ground building rhizomes and roots. 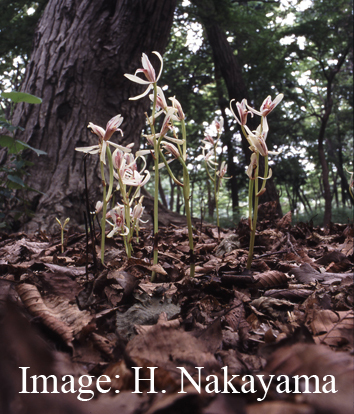 For a short period they do need to pop above ground to flower and fruit, and this is when Professor Suetsugu and his team work to document the mycoheterotrophic plants in Japan. 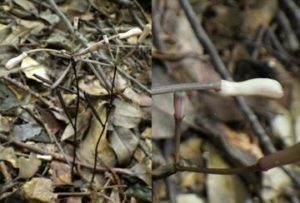 Professor Suetsugu’s research team noticed that L. nigricans (found in Japan’s Miyagi prefecture and Kōchi prefecture) bears fruit without blooming at all. The flower has spatula-shaped purple-tipped petals that don’t branch. From these characteristics the team were able to identify it as L. nigricans or a close relative. However, the species known as L. nigricans is documented as having flowers that fully open. This open-flower (chasmogamous) L. nigricans is found in many parts of Japan. L. nigricans was first discovered in 1931 by Masatsugu Honda in Japan’s Wakayama prefecture. In the plant description, he wrote “The flowers are not open, and the petals are connected to form a cylindrical tube”. From this description, it seems that the original L. nigricans did not bloom (cleistogamous). Professor Suetsugu’s team went to the place where L. nigricans was first discovered and verified that the species of L. nigricans in this region never opens its flowers. In other words, the original L. nigricans is the variety that does not bloom. 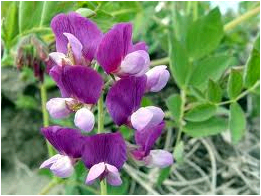 After further examination, the team found that this variety has other features that distinguish it from the open-flower L. nigricans: the closed-flower variety has smaller flowers, the colored area of the petals is larger, and the hairs at the end of the petals are branched. So what should we call the more common open-flower variety, if it is not L. nigricans? In 1981, Yutaka Sawa presented the open-flowering variety found in Kochi prefecture as L. nigricans var. patipetala. However, his description of the plant was very brief, and it was hard to go against the general assumption that L. nigricans is an open-flowering plant. L. nigricans var. patipetala in Kochi city, Haruno. The flowers open fully. Photo: Kenji Suetsugu. L. nigricans var. patipetala is generally the more common variety in Japan (in Kochi prefecture the closed-flower L. nigricans is more common). This may have led to the widely-held misconception that the L. nigricans var. patipetala is L. nigricans. 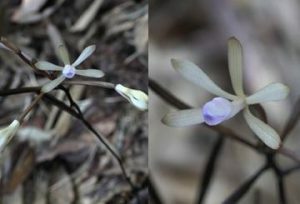 It is now clear that the species discovered by Yutaka Sawa is the same as the open-flower L. nigricans in other locations. As well as abandoning photosynthesis, the L. nigricans also self-pollinates – its flowers remain buds until they fall. Non-photosynthesizing plants such as L. nigricans often grow on the dark forest floor, an environment that bees and butterflies rarely visit. Because of this, L. nigricans and L. nigricans var. patipetala are both self-pollinating species. L. nigricans may have stopped opening its flowers because this used up too many resources. 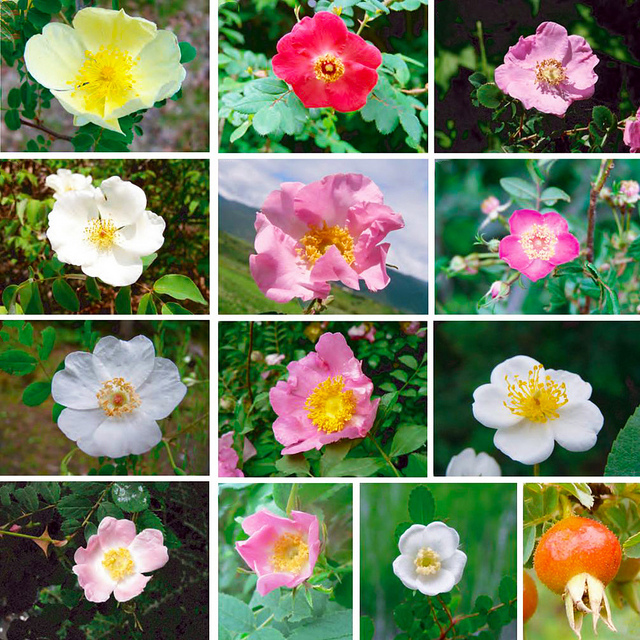 Similar evolutionary patterns are occurring in other mycoheterotrophic plants. When plants give up photosynthesis, this changes their relationship with other organisms, such as the insects who may pollinate them”, comments Professor Suetsugu. 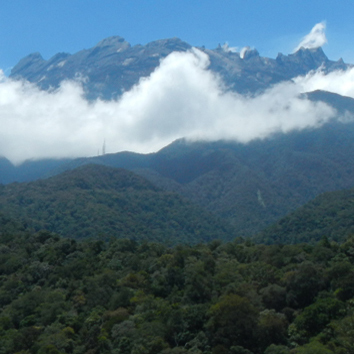 “Through taxonomic and ecological research on mycoheterotrophs, I will continue to study the changes that take place when plants make the extreme decision to abandon photosynthesis”. What happens now to agriculture in Japan?